Lake Eyre is normally dry; it fills completely only an average of twice in a century, but partial, minor fillings happen much more often. When completely filled (as in 1950, 1974, and 1984), the lake takes about two years to dry up again. Those dates are reputed to be connected to the phase of the Indian Ocean Dipole. The last decade there had been a horrible drought in the region. Predictions were that the drought would be permanent as part of “Global Warming”. Well, a strange thing happened on the way to perpetual disaster. It started to rain. First in 2011. Continuing in 2012. A flourishing Lake Eyre will provide a small mercy in the Queensland flood aftermath, with the lake expected to fill for the first time since 1974. All in all, an interesting place to watch as an “indicator”. My take on it is the Lake is saying “it’s getting cold again”. I note that the last we times were generally cold times too (though 1984 was more neutral). 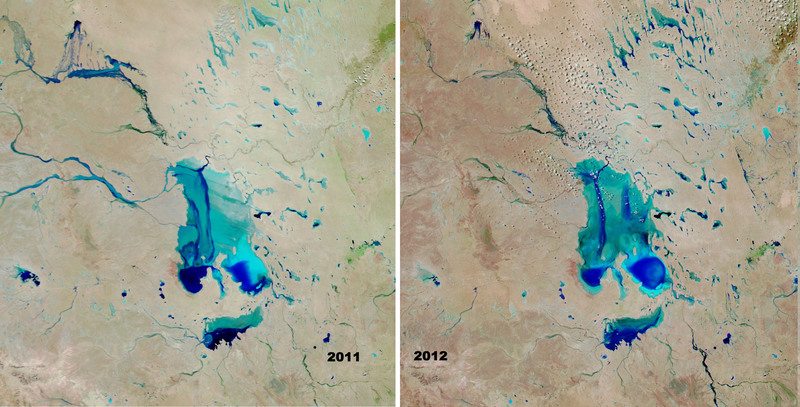 This entry was posted in AGW and Weather News Events and tagged Australia, Floods, Lake Eyre. Bookmark the permalink. who link events like lake Eyre floods to sunspots. Locally famous was Inigo Jones. Are you aware of Leif Svalgaards sun observations graph? At the moment it looks tlike a “head and shoulders” is that right? If so, it might mean that cycle 24 may have peaked already. Which makes it even more strange than expected. Wouldlike to get your opinion of the graph…. Don Gaddes often posts on various climate blogs about work done by his deceased father, Alex Gaddes. Don’s father believed global climate to be a result of various interacting cycles. Somewhere today I saw a post by Don where he was reporting that the current state of the globe was what he referred to as “wet / normal”, i.e. more rain but fairly average temperatures. I wish I could find the post I read by him today, but it is lost in the welter of my memory. If Don Gaddes reads this, perhaps he could explain the method of prediction his father developed. F10.7 has a rather high recent datum. Makes me reluctant to say “top is in”. At most I’d say “could be a top, so watch for a bit to confirm”. Haven’t done the work with the precipitation data to show if the thesis has anything to it or not. The main attractions of this track are the desolate saltlakes, the Ghan railway relics and the amazing artesian bores. This is it, unless you get really exited on gibber plains. But a railway enthusiast or keen scrap metal connoisseur like me will certainly love the Track. Mind you, there is an endless supply of wire and other bits and pieces lying around, so this is just the place to fix your exhaust fastenings for free!